"You need to be selective about what you do allow," he says. "We block all Android devices for now because of some of the security concerns that have come up and ease of management." 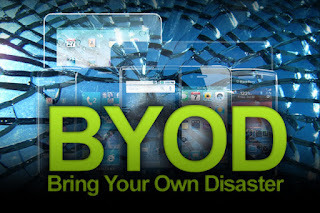 As what I had shared in my previous stories, there might be bad consequences if enterprises do not properly manage BYOD. Hackinthebox - 10 years in the box! Dear all Information Security Professionals, you shouldn't miss this one. It is one of the greatest security conference that you can get out there. And, did I mention that the price is dirt cheap compared to that of ... "you-know-which-one" conference. This year is pretty unique coz it is "10 years in the box". 10 awesome years if I may add (I'm sure Dhillon and Belinda et all) won't argue with me on this one :) ). Date? 8-11 October 2012, InterContinental, Kuala Lumpur.